Thanks to the rocky relationship between South Africans and Eskom, more and more people are turning towards solar power solutions as a way to ensure energy stability. One of the major obstacles preventing many households from harnessing this sustainable and renewable source of power, is the fact that installation comes attached with a rather hefty up-front cost. This is where solar financing through power purchase agreements (PPA) come in, allowing many households to overcome cost as a barrier. By lowering the up-front cost of solar, expansion of the addressable market has become a reality. Before we can discuss the multiple solutions available, it is important to first have a basic understanding of what solar power finance entails. In short, these agreements are contractual arrangements between consumers and third-party financers, where the consumer does not have to deal with the hassle of ownership. These hassles could include system maintenance, project coordination, construction and repairs. This financial arrangement makes it possible for the host customer to receive stable power solutions which are usually cheaper than Eskom’s or your municipality’s rates. We sat down with Blackwood Power, a leading energy services company, in order to find out more about their solar power finance solutions and processes. Solar packages can be broken down into three broad categories, based on what the client’s required outcome entails. The Standard Solution is there for clients who simply want the financial convenience of solar energy. The Storage-Enabled Solution is offered for those clients that are seeking to beat load shedding through the use of battery storage. Their Off-Grid Solution is provided for clients who wish to become completely independent of the grid. 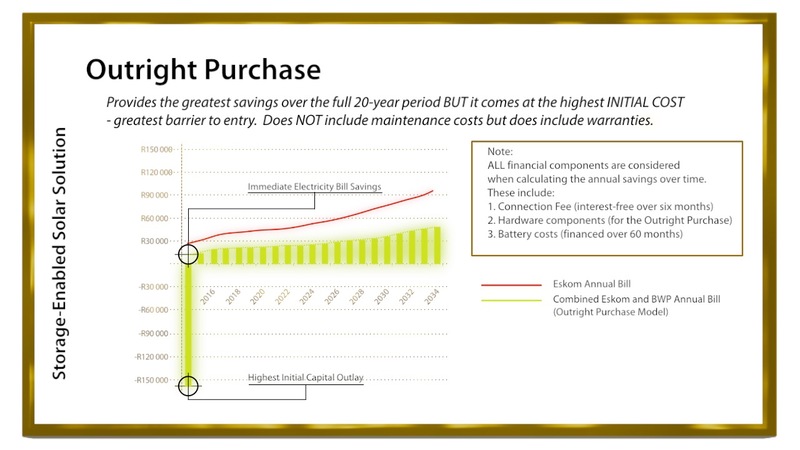 While this option comes at a higher initial cost, it provides the greatest saving over the full 20-year period. Once on-site evaluators have conducted an analysis of your requirements, they will provide you with a quotation that includes the anticipated power generation of your array. This makes it possible for you to calculate the break-even period on your investment. Part of this financing option includes the programming of the home management system, allowing you to optimise your solar consumption. 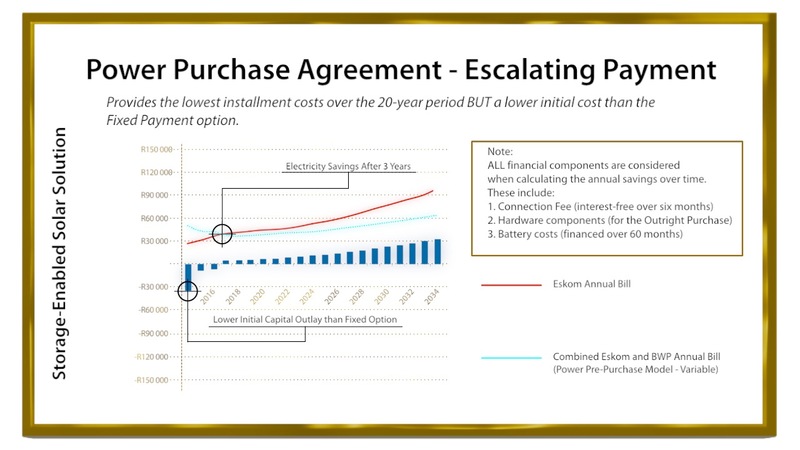 This financing option includes a full 20-year warranty on the PV panels, as well as a 15-year warranty on the inverters. While the cost does not include maintenance, an additional maintenance contract is offered as an option. Besides the outright purchasing option, the fixed payment option provides the best instalment savings over the full 20-year period. While your total electrical bill will be marginally higher than your existing Eskom or municipal bill for the first three years, after that time, savings will increase year-on-year. With this purchase agreement you will pay a pre-agreed fixed monthly amount for the life of the installation. While the instalment savings over the 20-year period are lower, compared to the fixed payment option, this financing agreement comes at a much lower initial cost. 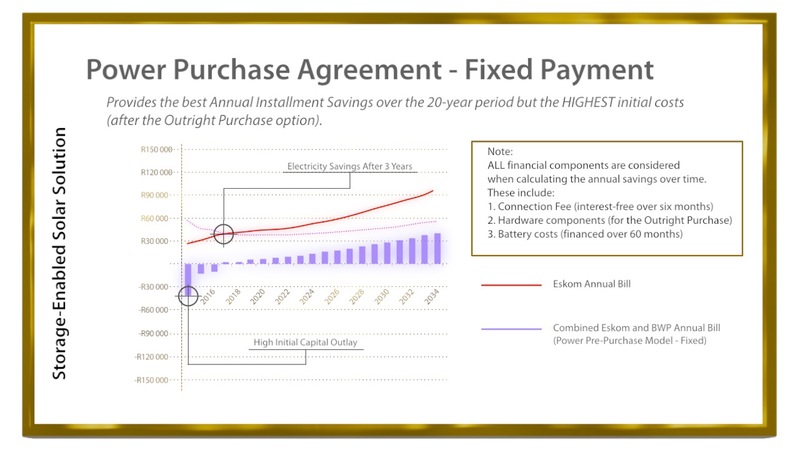 With this purchase agreement you will pay a pre-agreed monthly power free which will be adjusted annually in line with the South African prime lending rate. 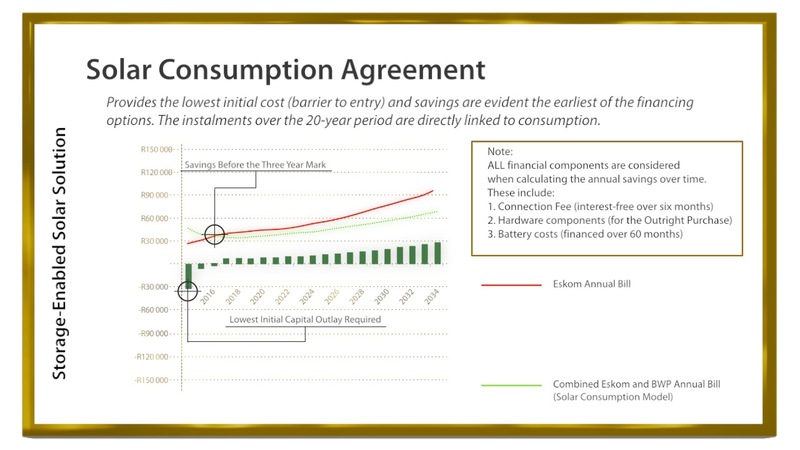 The solar consumption agreement provides the lowest initial costs of all the financial packages, with immediate savings seen with the Standard Solar Solution. If you opt for the Storage-Enabled Solar Solution, the added cost of the battery inverter will mean that savings will only be enjoyed three years after installation. We hope that this article has helped you understand the process of solar power financing. Soventix strives to turn your solar power dream into a reality! If you have any further questions, simply complete our contact form.